We are holding a essay contest for the entry below 7canto chapter 2 ..."Hiranyakasipu, King of the Demons"
The winner who sends the best essay to our protectacow@hotmail.com email will get the prize of a nice hunk of Gita Nagari Tilok! Good Luck and Hari Bol! Regarding the poisonous effect in our Society, it is a fact and I know where from this poison tree has sprung up and how it affected practically the whole Society in a very dangerous form. 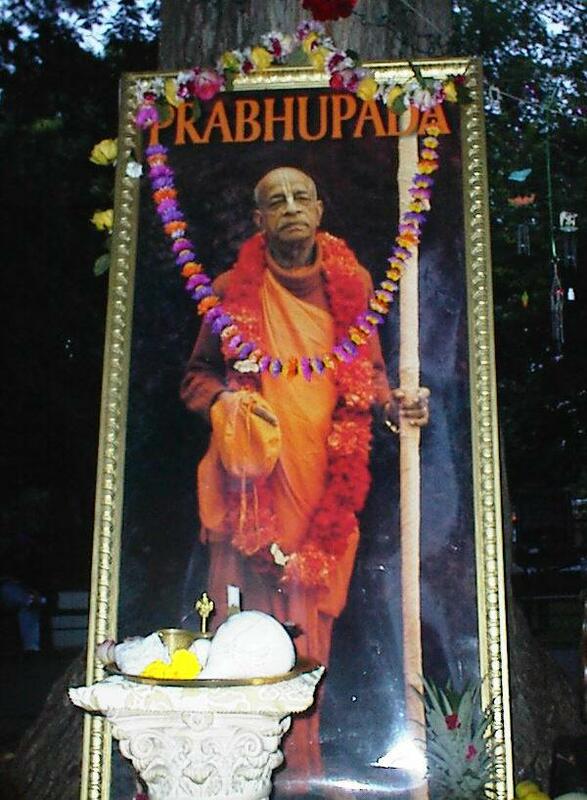 Prabhupada: So from restaurant you have got good income there? Tamala Krsna: Yes. Approximately, I would say, between $7,500 and $10,000 a month. That is not all profit, but that is the gross income. Profit? At least more than half profit. And much milk products are used. We supply the temple and the restaurant from the farm four hundred gallons of milk per week. Prabhupada: You get from the farm. Tamala Krsna: Yes. Every week we give to New York temple four hundred gallons milk. Prabhupada: And you turn into chana? Tamala Krsna: Chana and also milk, straight as milk. The devotees get sufficient milk, and also cheese for cooking. I wish to present an analytical study of Bhagavad-gita as it is. If your people can grasp the direct meaning of Bhagavad-gita it will be possible for us all to understand the basic principle of cosmic harmony. When that is done we shall know then that all adjustment of our existence is not only peaceful but an eternal bliss distinguished from the ephemeral sensual satisfaction. We shall then only know that here is world where there is no struggle for existence and every living entity, never mind what it is, is fit to exist. Quotes from Srila Prabhupada below translation Srimad Bhagavatam 7th canto chapter 2, verses 7,8,and 12. Another fact disclosed herein is that demons are very much fond of sucking blood. Indeed, all of them are meat-eaters and bloodsuckers. Because the Vedic civilization is lost, cows are not protected, but instead indiscriminately killed in slaughterhouses. Such are the acts of demons. Therefore this is a demoniac civilization. Click Continue to Read Here....... Make sure to see and hear the Summary Study after the Verse and Purport. Link to Krishna, Gita Nagari History and more! CLICK THIS LINK TO GO DIRECTLY TO OUR KRISHNA WEB SITE! Several thousand years ago a great pious emperor ruled over this planet. He was a descendant of the great Kuru dynasty and the grandson of Arjuna, the hero of the Bhagavad-gita and the personal associate of the Lord, Sri Krishna. The people lived under his domain in peace. He provided protection for the people and the cows, as well as all other living entities. Five Substances from Mother Cow! The ingredients of panca-gavya are milk, yogurt, ghee (clarified butter), cow urine and cow dung. All Donations are used strictly towards the Cows feed and up keep. We can offer a Back to Godhead Magazine or a copy of the first article on Srila Prabhupada in the west, for a donation of $20 dollars or more. Please send us your request. The Geeta Nagari will therefore be the main preaching centre of the Supreme Authority of Sree Krishna the Personality of Godhead. click here to view or below.